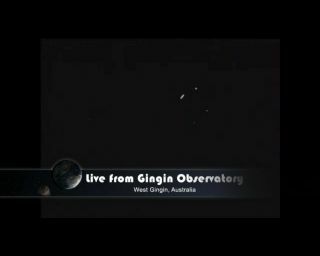 Asteroid 2012 DA14 is seen by Gingin Observatory, West Gingin, Australia, as the space rock made its closest approach to Earth on Feb. 15, 2013. The asteroid appears a streak because of its high speed. An asteroid half the size of a football field buzzed Earth in a historic flyby today (Feb. 15), barely missing our planet just hours after a much smaller object exploded above Russia, injuring perhaps 1,000 people. The 150-foot-wide (45 meters) near-Earth asteroid 2012 DA14 cruised within 17,200 miles (27,000 kilometers) of Earth at 2:24 p.m. EST (1924 GMT) today, coming closer than many communications satellites circling our planet. The flyby marked the closest approach by such a large asteroid that astronomers have ever known about in advance. But it wasn't even the most dramatic space-rock event of the day. Scientists think the Russian fireball was caused by a object that was about 50 feet wide (15 m) and weighed about 7,000 tons before it hit Earth's atmosphere. For comparison, 2012 DA14 tips the scales at 140,000 tons or so. The two space rocks are completely unrelated, NASA researchers say, making the dual events a spooky cosmic coincidence. Astronomers had been looking forward to 2012 DA14's flyby for a while, since it gave them the rare chance to study a decent-size asteroid up close. "We're going to use our radars to bounce radio waves off this asteroid, watch it spin, look at the reflections and understand its size, its shape and perhaps even a little bit about what it's made of," Jim Green, director of NASA's planetary science division, said in a video released by the space agency Thursday (Feb. 14). Indeed, researchers around the world trained instruments on 2012 DA14, tracking the space rock as it cruised toward Earth, gave our planet a historically close shave and then slipped silently off into the depths of space once again. There are lessons to be taken from today's asteroid flyby and fireball blast, researchers said. "Today's events, both with 2012 DA14 and the Russian meteorite, are a reminder that our solar system is a crowded place," Chris Lewicki, president of asteroid-mining firm Planetary Resources, wrote in a blog post today. Our planet has indeed been pummeled by asteroids many times over its history — perhaps most famously 65 million years ago, when a 6-mile-wide (10 km) behemoth wiped out the dinosaurs — and it will continue to be struck in the future. The good news is that we probably don't have to worry about a potential civilization-ending strike anytime soon. NASA researchers have mapped out the orbits of 90 percent of the biggest and most dangerous near-Earth asteroids, and none of them seem to be on a collision course with Earth in the foreseeable future. Spotting the most threatening of these space rocks may require lofting dedicated asteroid-hunting space telescopes, researchers say. The nonprofit B612 foundation plans to do just that; in 2017 or 2018, it aims to launch an instrument called the Sentinel Space Telescope, which would scan Earth's neighborhood from a Venus-like orbit, freeing it from having to contend with the glare of the sun. Astronomers estimate that asteroids the size of 2012 DA14 buzz Earth this closely every 40 years and hit our planet once every 1,200 years or so. If 2012 DA14 did hit us, it would probably cause severe destruction on a local scale. In 1908, a space rock thought to be of similar size exploded over Siberia, flattening about 825 square miles (2,137 square km) of forest.